So today I awoke to some issues that you don’t want to hear about, and after a few attempts it became clear that I was not actually going to succeed in leaving the house. So I laid around trying to not feel too wretched. This is not as easy as it sounds, sometimes. Eventually I resorted to a book on CD and some minor household tasks to amuse me. I’m not much of a seamstress but if you have something that requires repair and it won’t be worn out in public ever, I’m totally the gal for you. I have honed my skills on stuffed animals with split seams or that the dog has taken a liking to, the occasional wayward button, and now: a sleeping bag. The spawn have these kid-sized sleeping bags of the sort one might use at a sleepover or summer camping, and recently I was compelled to wash them. They had that slightly mildewy-smelling funk that things get from being stored in the garage, and they’ve seen a few gymnasium floors in their day (for elementary school movie night). Unfortunately one didn’t survive the experience unblemished, and I was faced with a six-inch split seam. Now, I don’t own a sewing machine. The thought of it terrifies me. I would be That Lady who sews things to other things by mistake, perhaps even to something I am currently wearing. It wouldn’t be pretty. So I got out the little sewing kit that we keep in the drawer in the kitchen and I found some pink thread and I sat right down on the couch and started sewing that bad boy right up. I even used a few pins to keep the slippery nylon fabric edges together so it wouldn’t keep slipping and sliding around. I’m practically ready to be a costumer for the New York Metropolitan Opera, yo. The seam isn’t beautiful, but the object here — to keep the insides of the sleeping bag from becoming the outsides — has been accomplished. And I figure this little repair is saving us forty-five dollars plus tax. Because if we replace one kid’s fifteen-dollar sleeping bag, we’ll have to replace them all; otherwise there will be resentment and grudges and eventually they’ll do drugs and sleep around because of how unhappy their childhoods were. We can’t have that. Now I just have to figure out how to spin the whole thing so it’s actually super cool to use the one with the big awesome scar on it! I was still feeling pretty pitiful but was so torn with wanting to do something useful. 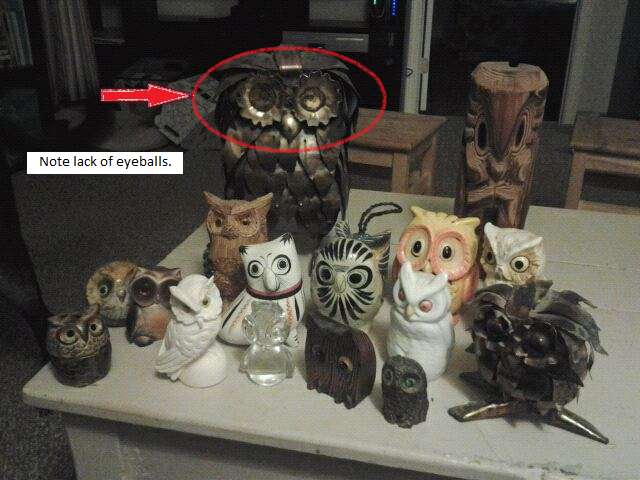 I looked around for another one of those things I’d been meaning to do and spied a pair of eyeballs on my desk. Obviously this would require SuperGlue, so I rummaged around in the junk drawer and found some. 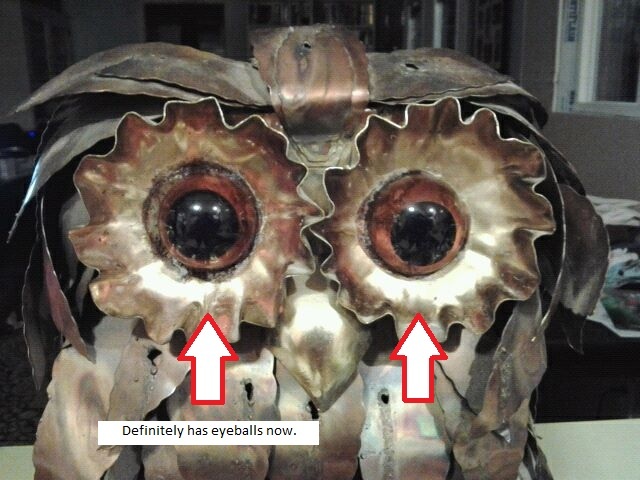 Pretty soon Big Lethal Pointy Metal Owl had eyes again. He’d had them initially, but then they fell off when we unwrapped him. I guess if I spent a year wrapped in newspapers inside a cardboard box in somebody’s garage my eyeballs might fall off too. I think he looks a bit better with eyes. I’d gotten used to seeing him with no eyes, so now he looks kind of surprised all the time. Or angry. Later I finished something I’d started the day before, wherein I had run hot water with bleach into my washing machine and let it soak for a while. Then I ran hot water with vinegar in it. This allegedly loosens up the grim and “scale,” whatever the hell that is. Then I got an old, slightly scratchy washrag and essentially sanded the grime deposits off the agitator and the rim of the wash tub. I went ahead and ran more hot water and threw some vinegar in there, and let me tell you, I have no idea how the clothes ever got clean in that thing considering how much it stank to clean it like this. A crapload of crud came out of the various nooks and/or crannies. Yech. By the end of the day I was feeling somewhat less horrible. Apparently the absence of vileness caused me to completely lose my mind to some kind of post-malaise euphoria, because I then found myself under the kitchen sink removing everything from the cupboard and scrubbing it out. I’m going back to school in a little over a month and I think I want things to be halfway orderly before I start. We’ve reached Defcon Level: Crusty around here lately, and I’m doing my fall cleaning or something. One crummy little project at a time. So today I went out to my cousin’s new apartment and helped her move, a little. I qualify that because I’m not well-suited to moving people’s stuff in general, because I got bad feets. My feets is so bad, after half an hour of shifting a few boxes and standing around trying to be helpful they are already starting to grumble. But I figured I’d be as helpful as I could be under the circumstances which in the case of moving usually consists of going to fetch lunch, which I did. I got two pizzas and some soda and ice and a six pack of decent beer. The pizza was gone in fifteen minutes and the beer was prized away for that moment later in the evening when it all catches up to my cousin and she will be in need of some anesthetic fortification. I’m just going to say, she has a lot of stuff. Like, a lot. Of stuff. And also? Third. Floor. Apartment. Anyway, after the stuff was all moved into the apartment or onto the handy covered landing outside her door, some cousins departed for home. Some other cousins had to drive out to where yet another cousin was playing rugby, to drop some stuff off to her. She goes to school kind of far away and happened to be in the area for a tournament. I decided to tag along, in part just to get off my feets. By the way, rugby is awesome and even though I had to sit on a plastic bag in the chilly bleachers trying not to listen to a girl behind me somewhere, I had fun watching. The reason I was trying not to listen was because she had had the tremendous foresight, not to call it UNMITIGATED GALL, to bring a ukulele. She could neither play this ukulele nor could she sing, yet she felt compelled to try her hand at both, in public. In case this was insufficiently unbearable to standers-by, the song she assaulted us with was Katy Perry’s “Firework.” I don’t actually dislike this song but let’s just say that it doesn’t really translate to ukulele all that well. Anyway, while we were at the match and at a Starbucks afterward I observed the lone male cousin engage in a curious pastime. It began as we squelched our way down the hill toward the field. We crossed paths with a fellow somewhere within ten years of our ages (we are all mid 40’s ish) who was drinking a beer from a bottle and wearing a baseball cap bearing a sports team logo. Cousin Tom was wearing a sort of a sweatshirty thing bearing the same logo and called out to him, HEEEEY STEELERS! And then they had a friendly and familiar conversation about the Steelers and some other teams, as though they were actual friends and not just two guys crossing paths at a rugby tournament. I thought this was interesting but didn’t think much else about it until a short time later, still at the rugby field, when it happened again. And then at the Starbucks, with the tall, silver-haired manly-guy barista, except this time it was the barista who noticed the logo on Tom’s outerwear and initiated the conversation. Is this a guy thing? Because I can’t really think of something comparable amongst the ladies. I mean, we might notice each others’ Coach purses or something, but it just doesn’t seem to me that it would consistently generate this kind of spirited interaction. Then again I don’t think there’s the same kind of heated partisanship among handbag enthusiasts as among sports fans. Maybe if it were two ladies wearing roller derby t-shirts? Ooh, what if they were fans of rivaling teams? It might be kind of awesome. Why I’m not so much of a dog person. So we got this new dog and his name is Jake. And he’s a dog. And he barks. Jake barks at the doorbell. Except, we don’t actually have a doorbell. Poor Jake! How can he bark at the doorbell if we don’t have one? I’m so glad you asked me that question. Jake barks at the doorbell that rings on TV. Guess how many doorbells ring on TV? LOTS of doorbells ring on TV. And sometimes, when you’re up late watching a little TV by yourself because you can’t sleep or The Lovely Rhonda has gone to bed at 9:30 because she is in the ICU tomorrow or whatever — sometimes, the doorbell on TV rings really late at night. And of course if Jake is going to bark, BY GOD I MUST BARK AS WELL says Otto. So there you are just watching some crappy rerun of The Nanny or something in the quiet of the night and suddenly there is a cacophony of dog barking. And you have to shush everybody before TLR comes out of Grone Up Land (as one of the kids spelled it) and murders us all with just a look. That look. That one look of flaming instant death. It wouldn’t help to remind her that these dogs? These noisy, hairy, smelly, flatulent dogs? That bark at the TV and poop in the yard and chew things up? These dogs were HER OWN DOING. No, no. That wouldn’t help. Don’t do that. Let’s move on to cats. They poop and pee discreetly in the bushes. They have never barked, in my experience. Even if a doorbell goes off on a TV show late at night, there is no barking from the cats. I have yet to meet the cat who will, left unattended, chew the right shoe off of a La La Loopsy doll left on the couch by one of the children. Last night I was obligated to feed the dogs because TLR had worked all day whine whine whine and had to get up early tomorrow whine whine whine. Ugh, fine I’ll do it if you stop whining. So I went to head outside where the dry dog food is kept in a big plastic bin on the back porch. Except I had picked up the big dog dish and Jake was so excited about FOOD OMG DINNER that he jumped up at my hand and knocked the dog dish out of it and it fell on my toe with a big metal CLANG. And it hurt! It hurt in that way that you have to hold really still and Not. Say. Anything. for a minute or else you’ll blister the paint off the walls with your colorful invectives. And then I had to open the can of wet food to smush into the dry food, because I am now a short order cook for dogs, and the smell about knocked me over. The worst part about this is that the can has to be cleaned out with a dish brush so you can recycle it, because the dog food sticks to the inside of the can like paste. GROSS. And then I fed them and had to sit in a cloud of dog food smell, dog-breath-after-eating-dog-food smell, and, after a deceptively short time, the smell that dog food makes when it has navigated its way through most of the dog. TLR had already gone to bed so it was just me and the dogs and the smells. And the doorbell on TV. Because nursing school was so much fun. I’m going back for BSN, probably MSN. Glutton for punishment? Clinically insane? A little of both, probably. So about three years ago The Lovely Rhonda and I moved into this house. I like to call it The Swamp because that makes me feel all Shrek-y, and who doesn’t like Shrek? If I were green and my ears stuck out a bit I might be rather Fiona-esque. Well, I guess I’d have to be younger too. And royal. Also, a bit nicer. Anyway, back to The Swamp. It was — and pardon me but there just really is no other word to describe it — a bit of a shithole. The Ex-Mister-The Lovely Rhonda lived in it for a year as Bachelor Dad Guy, with their girls (ages 3 and 1) there with him half-time, and let’s just say that his housekeeping standards were somewhat lax. The front window had broken vertical blinds that wouldn’t open, everything smelled strongly of the dog, and the entire interior still sported the weird peachy-tan color that it had been painted before they bought it, a year before I blundered into TLR’s life and completely decimated it like Godzilla over Tokyo. It’s a 70’s tract house and anything we do to it short of demolition is likely to improve it. Come to think of it, demolition doesn’t sound too bad. But I digress. The first thing we did when we moved in was paint as many of the rooms as we could. This included borrowing a sprayer and giving what was the master bedroom several coats of primer and then paint. This was necessary because The Ex Mr. TLR had retaliated to having his wife leave him for another woman by painting what had been their bedroom Manly Guy colors. Apparently there is a paint selection for the recently divorced gentleman featuring such shades as single-dad-forgot-the diaper-bag-again toddler-poo brown and ashes-of-my-cold-dead-marriage gray, because those are the colors he chose. It took twelve solid hours of work and four coats of paint to make it habitable again. At any rate, we’ve made many other changes since then such as knocking out a wall, making half the garage into our bedroom, replacing a sliding glass door with a window, and (ongoing) having new siding installed. And we made the customary pilgrimage to Ikea for a modest entertainment center and some low bookshelves to put in front of the front window. This is an improvement over the previous arrangement but unfortunately now it means that the curtains covering the living room window are too long. Enter writer’s mother, stage right. So my Mom is going to hem them for us, because she is awesome like that, and so now you know why I’m spending part of my day cleaning the front window and replacing the drapes with mismatched curtain panels left over from the former sliding glass doors. SEE HONEY I’M NOT A HOARDER, I’M JUST PRACTICAL.